Barcelona midfield legend, Andres Iniesta had spoken up about Lionel Messi and Ballon d'Or, at a promotional event in the city of Barcelona, where he claimed that Messi is the best player in history, MARCA reported. Iniesta was back in the city where he developed into a footballing icon, following his first spell with the Japanese outfit Vissel Kobe, in the J1 league. Talking to the media present at the event he avoided commenting on Pele's 'One-skill' remarks about Messi, saying that it was his opinion, but at the same time made it clear that for him Messi will always be the greatest player in the sport's history. He also added that Real Madrid's Luka Modric, who had an extraordinary year with club and country, deserved to win the Ballon d'Or. Iniesta, who is considered by many as one of the greatest midfielders of all time and has won every single major trophy with club and country, was never voted as the top player at the Ballon d'Or awards. Messi and Iniesta played together for 14 seasons at Camp Nou and won 9 LaLiga titles and claimed the UEFA Champions League trophy 4 times. Messi inherited the captain's armband from the player, when he left his boyhood club, at the end of last season. Messi has been unstoppable this season and has already scored 17 goals and assisted 10 more in 18 appearances across all competitions for the club. Iniesta, who was talking to the media at a promotional event for Ariel, carefully avoided responding directly to Pele's harsh criticism of Lionel Messi but declared that as far as he is concerned there has never been a better player than the venerable Argentine. "I do not want to answer what Pele said." "But he [Messi] is the best player in history, he's got all the records: headers, skills, right-footed shots, left-footed shots - I have not seen anyone do what he does and every year he exceeds my expectations." "[Being] fifth [in the Ballon d'Or voting] is not an insult, but for me he is the best." "It would be bad to say that it was unfair for Modric to win, he had a great season." 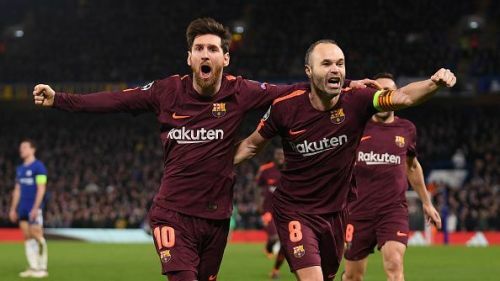 Lionel Messi is chasing another treble with Barcelona this season, with the Catalans giants on top of the LaLiga table, have made it into the knock-out stages of Champions League. After their draw in the Champions League against Tottenham Hotspur yesterday, they'll be heading to Estadi Ciutat de València to face Levante in the LaLiga fixture.